Today’s review is for the InstaNatural Stretch Mark and Scar Cream. The formula promises to combat the red or blue colouration marks, whilst preventing future damage, and acts as a vitamin rich moisturiser too. The cream is aimed at both men and women. The brand provides a host of real natural products, and this is no exception. With handfuls of natural ingredients, this blend is full of natural essential oils, butters, and extracts, with a vitamin C boost. The active ingredients include a high dose of Vitamin C, mango butter, cocoa butter, and evening primrose oil, known for their moisturising, invigorating and skin tightening qualities. The recommendation is to apply gently twice per day, so after your morning bath or shower, and again before bed is ideal. There is no risk of applying too much of this stuff, it sinks right into the skin and leaves it feeling soft and silky. We certainly haven’t had any concerns, and looking at the ingredients it doesn’t seem as though there’s not much of a risk. If you have plant allergies perhaps be sure to check the ingredients, but otherwise there are no dangers here. 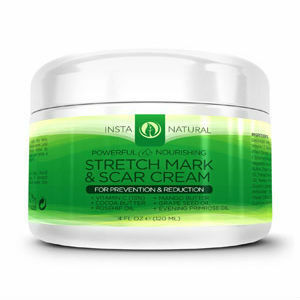 At $23.95 for a 4oz pot the InstaNatural stretch mark and scar cream is really good value for money for all the qualities it boasts. That’s not all though, offers are frequent, and if you check Amazon then you can have 5, 10, or 15 % off when you buy more than one product from the InstaNatural skincare range. Always be sure to shop around. InstaNatural really shows their confidence in the product with their full lifetime money back guarantee, to all of their customers, across their range. That means if you are at all unhappy with your product, or don’t get the results you were hoping for, then InstaNatural will give you your money back. The Instanatural cream is a really strong contender if you like your skincare products to be natural and organic. Also they offer a lifetime money back guarantee which is great, you should always put your money on products which will give you a full refund if you are unsatisfied. Even though the cream has really natural ingredients, they do use palm oil which has become controversial for environmental reasons recently. The only other thing I might say is that the cream seemed to be finished pretty quickly, so the value for money isn’t as great as it first seems. David Carney	reviewed Insta Natural Stretch Mark and Scar Cream	on August 5th	 and gave it a rating of 4.